Light NE turning NNW, mainly sunny. Nets open 06.30-18.30, netmeter hours approx. 4200. Playback on Garden Warbler, Reed Warbler and Grasshopper Warbler through the night and early morning, later on Tree Pipit, Meadow Pipit, Grey Wagtail and European Goldfinch. Ringed: Dunlin 1, Great Spotted Woodpecker 1, Meadow Pipit 17, Tree Pipit 4, Song Thrush 1, Whinchat 1, Reed Warbler 2, Garden Warbler 7, Blackcap 1, Willow Warbler 4, Chiffchaff 1, Tree Sparrow 1, Chaffinch 4, Greenfinch 2, Eurasian Siskin 10, Lesser Redpoll 2, European Goldfinch 1, Yellowhammer 1. Total = 61. Also 8 controls, including a Eurasian Sparrowhawk not from Revtangen (probably from nearby ringing site at Tangen, Ergavatnet). 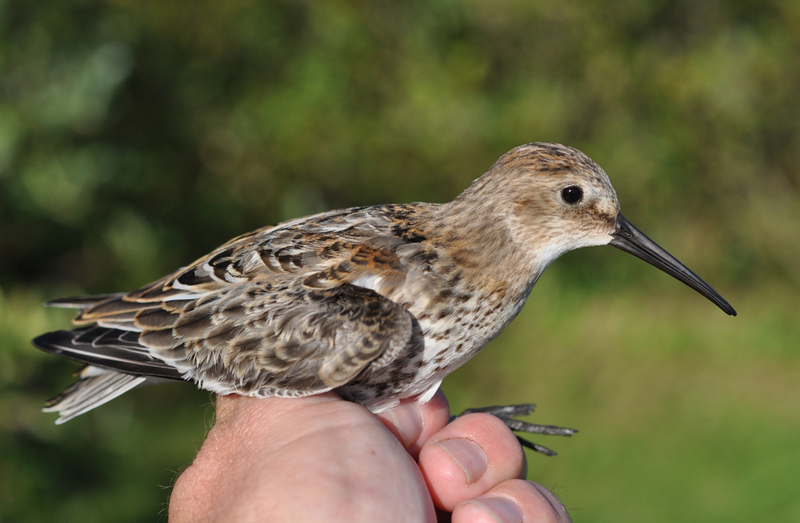 This 1 cy Dunlin was a surprise catch by the observatory pools in the afternoon. Myrsnipe 1K. 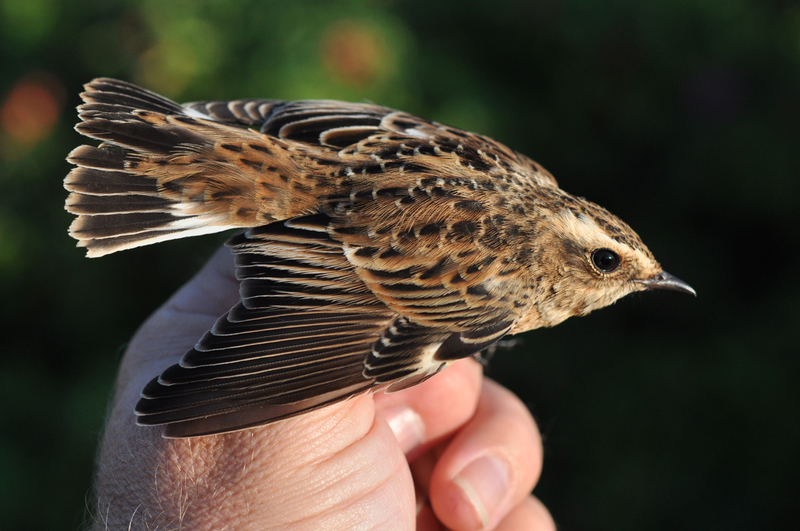 The last catch of the day was a new species in the 2018 ringing total, a 1cy male Whinchat. Buskskvett, 1K hann. The best catch of the day was in one of the Robinson-traps. 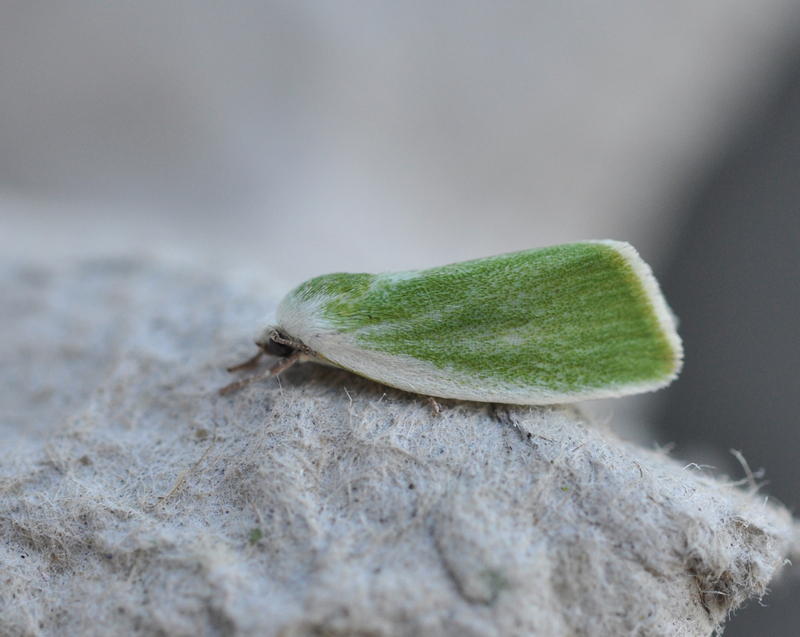 This Cream-bordered Green Pea (Earias clorana) was a first for Western Norway, and also the first September record from Norway.